Equally important in the runnings of Zimbabwean music is a slim package of energy with a formidable and husky but sweet voice called Oliver Mtukudzi. Although Oliver is generally regarded as a traditional musician, it is somehow difficult to classify his music. Apart from a few tunes which are sung in English or Ndebele, most of his music has Shona traditional lyrics. The traditional aspect of his music therefore comes from the words he uses for his songs even though the supporting rhythms to these songs are similar to the simanje-manje or mbaqanga beat common in South Africa. There are very few similarities between his beat and the one Thomas Mapfumo is identified with, yet Oliver admits that he has been greatly inspired by Thomas Mapfumo. Oliver is unique in this respect because he has developed a style no other well-known Zimbabwean groups have and when performing live on stage his 'cough' gimmick (where he punctuates every line of his lyrics with a cough) has become a trade mark unique to Oliver. This sends his fans wild. "I was born in 1952 and I am the first born in a family of six. I have three brothers and two sisters. "I went to Chipembere Primary School at the age Of 7 and later went to Highfield Secondary. I left school at the age of 19 in 1971. By then I had already begun to get involved with music seriously. Despite the fact that I decided to become a professional musician in later years, I believe that I was born a musician. "Before I was ten years of age, I was involved in both the school choir and church choir, singing mainly church songs. At the age Of 16, I already felt that I was an accomplished singer and that year, in 1968, I penned my first song. After had written this song, I asked some of my friends to join in so that we could get a group together. None of my friends were interested, and I said to myself: One of these days when I make this a hit, you guys are going to like it. I'm sorry, I can't remember the title of this song as it was my first tune. Besides I never thought that I would eventually compose many more tunes which would be successful. All I remember about that tune is that it had what we called a jiti or tsabatsaba beat which are the traditional beat sounds of Zimbabwe and South Africa. "A lot of people have suggested that my music has South African links but I describe my music as traditional based invariably on the local sound which began in Zimbabwe before I was born. "There are several versions of this traditional beat as you well know, depending on the region. There is Mbakumba, Nhxuzu, Katekwe, and Jerusalema, all of which stem from different parts of the country. These are the rhythms I have listened to and somewhere along those lines, lies my own beat. I have tried to combine all these various beats which are the true, free expressions of Zimbabweans from each region where that kind of music is sung and danced to in order to make a national rhythm. "When I left school in 1971, I started to look for a job. This was one of the most difficult experiences I ever faced, but I eventually found a job as a stationery salesman with a Harare Company. After a year I got fed up with the job because it did not have any prospects at all. Worse still, I hated the job. What I really wanted to do deep down in my heart was to play music, but I was scared of my parents' reaction to this because musicians were and still are classified as beggars, rascals and lawless people in Zimbabwe. I hated the thought of my parents classifying me as one of those people even though really wanted to become a musician. After I quit the job as a stationery man, I was a 'machayanyoka' (a layabout or an unemployed person) for the next three years. I was still looking for an alternative job but all in vain. After three years of hard-nosed looking, I eventually got my second job as an insurance broker where I was paid on commission basis. This job proved to be very unsatisfactory as I could not make or save any money. Within a period of six months, I had again left this job to seek greener pastures. "Using my meagre savings I bought my first box guitar. This caused a lot of conflict between me and my parents who did not like to hear the noise I was making with my guitar when, according to them. I should have been out looking for a job. This prejudice was enhanced by the fact that they believed that I was now going to become a dirty, lazy and never-want-to-work layabout who would go around the townships with this guitar in order to earn the odd penny. "They tried each and every morning to knock some sense into me, but I stood firm. My mother used to cry, "Do you realise that you will never get married if you become a guitar player?" They never thought that we musicians can lead a happy normal life with a bright future. "At one point, I felt like moving out when this conflict continued but being the first born, I felt that the responsibility to look after my parents rested with me. Besides, I did not have enough money to set up home on my own. However, despite these feelings, I didn't blame my parents for speaking out against my music career for I knew that it was the concern they had about me and my future and the love for me as their son which led them to be so antagonistic. They failed to understand who was going to pay me as a musician. So I struggled hard to make certain that I proved them wrong by showing them that music was just as good a career as any other — with a bright future. "It was in music that I really felt my career would be found. After trying out two jobs and looking for more in vain, I knew that there was nothing else out there for me except music. "I later met a friend, Moses Kabubi, who was already an accomplished musician and played with well-known bands such as the Sounds Effects at the time. He is the one who finally showed me how to polish up my guitar playing. After this, I became a proficient guitar player and decided to try my luck in song writing again. "In 1976, a lot of local musicians were now cutting records with Teal Record Company and with Gallo. I approached Crispen Matema, who was the producer then, to discuss the possibility of recording some of my material. On agreement, I recorded a single called 'Pezuma' with just guitar backing and my sister Bybit singing on it. The single was one huge flop but I was not discouraged by it. From this flop, I learned what was needed to make a hit. I found out how shallow my song writing skills were. I also discovered that I needed more musicians or more instruments to give my music a more commercial basis. "As a result I joined The Wagon Wheels Band in the same year and concentrated on making better compositions. My theories were proved correct because we then went back to the studios and recorded 'Dzandimomotera' but this time with Gallo Records. This tune became an instant hit and I believe it still is to this day. I must admit that some of my inspiration to write such songs came from Thomas Mapfumo who was already known as the guru of traditional music at the time. As a matter of fact, we shared the stage one day and even though our singing on the same bill was brief, I learnt a lot. He inspired me to do my own thing and to this day I have a lot of respect for the man and his talent. With The Wagon Wheels both Thomas and I toured Kadoma and it was there that he actually gave me this inspiration. "1 later left the Wagon Wheels and formed my own band. We recorded songs like 'Dzandimomotera' and 'Mutavara' before the band split up. These two songs were major hits countrywide and it was unfortunate that at this exciting stage of my career misunderstandings began to arise. You see, the management which owned the equipment we were using became jealous due to our increasing success. We were forced to break our contract and decided to go our own way, just as Thomas had done in the past. "After the split, the new line-up was made of Robert, my brother, on keyboards, Bybit, my sister on vocals, James Austin on drums, Joseph Alphonso on bass, Batholomew Chirunda on lead guitar, Felix John on rhythm guitar and three girl dancers, Tsitsi Muchaneta, Eva Mbera and Winnie. We called ourselves The Black Spirits. "Even though we had made successful hits, we had still not reached a full musical direction. On stage, we still concentrated on foreign music particularly Zaire's rhumba. 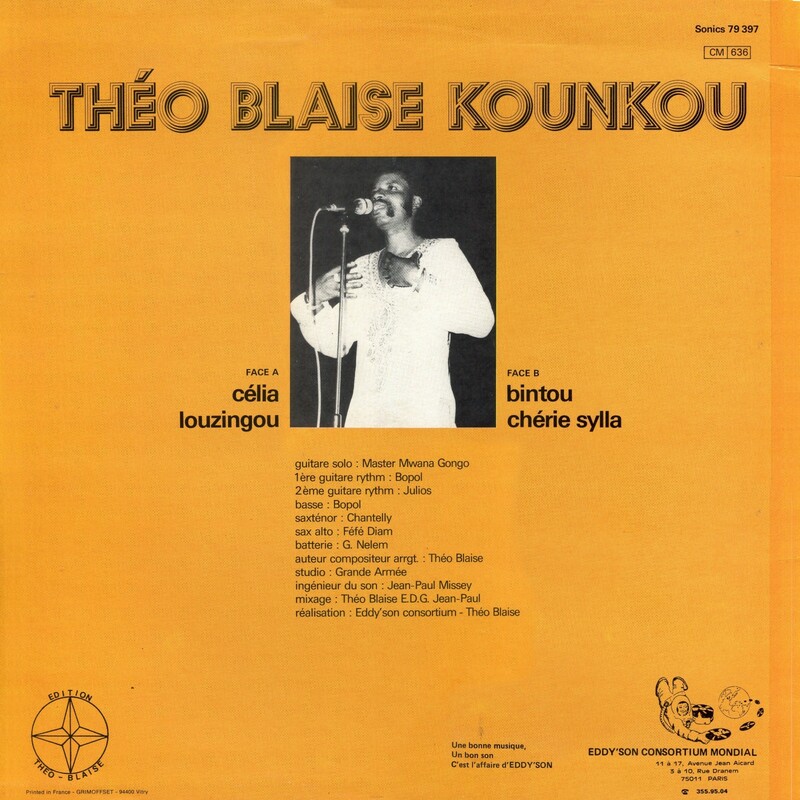 I suppose we were attracted to their style because musicians from Zaire (then known as Congo) had better recording facilities than those which existed in Zimbabwe (then Rhodesia). "But as I wrote more and more songs, we found ourselves increasingly playing more and more of our own material on stage. 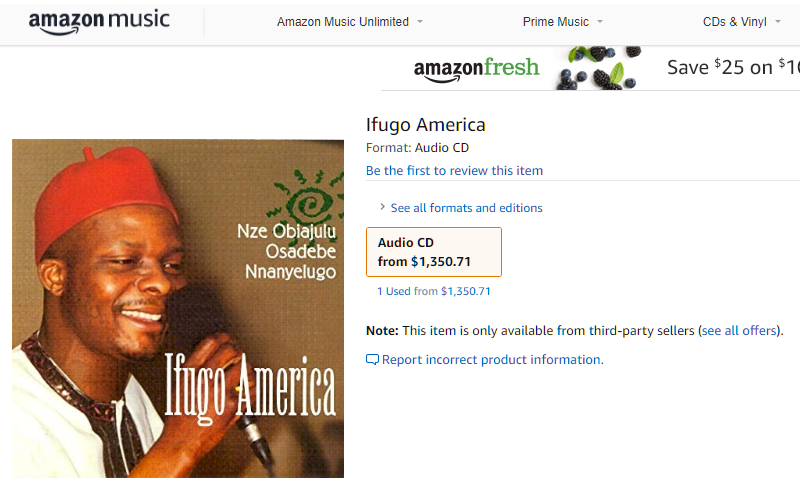 My first album was released in 1978 and this was called 'Ndipeiwo Zano'. It did very well. With so much success in the music world, my parents began to view things differently now. "When my first royalties came, I took the money home to them and showed them how I was going to make my living. From that day onwards, I have had their full support. They have not looked back either. "My greatest moment came towards the end of 1979 when the curfew, imposed because of the war situation in Zimbabwe, was lifted. I took advantage of this and put my band on the road. For the first time, the whole country was able to see our live act and of course this increased record sales. We had not toured before for fear of harassment by security forces. Oliver has toured most of the neighbouring countries including Zambia, Botswana and Malawi where his music has been greatly appreciated. Between 1978 and 1985, he released ten albums which are: 'Ndipeiwo Zano', 'Afrika', 'Ndapota', 'Chokwadi Chichabuda', 'Muroyi Ndiani? ', 'Shanje', 'Maungira', 'Greatest Hits', 'Nzara' and 'Hwema Handirase'. Almost all of his recordings carry the same social themes: starvation, poverty and suffering. These melancholic and sorrowful messages have managed to successfully touch the emotions of the people who buy his records to the extent that they now regard Oliver as their source Of inspiration. In the L.P. 'Nzara' (which means starvation), he concentrates on themes such as drought, baby-dumping, and the evils of society. Oliver has recently become well versed in controlling his own fate by becoming a business manager of his own affairs even though he still works with music promoter, Jack Sadza. He has had his ups and downs in business. For instance, when he was contracted to a Highfield night club, he found that he could not make any extra money in spite of a lot of offers that were put forward to him because the management would not agree to this. When he eventually left that night club, he made more money through live performances than he ever realised he would. Lately, Oliver has begun to write Ndebele songs which he originally writes in Shona, then gets someone else to do the translation. His attempts at writing English songs seemed not to have had a wide approval from his fans. For instance, the song 'Ghetto Boy' which he recorded in 1982 and gave it a reggae beat was not applauded by most of his fans and critics seemed to tear this new idea apart. Between 1982 and 1983, Oliver left his band, The Black Spirits after some misunderstandings and joined the Ocean City Band. This was a major set-back for him because this new band could not play his beat the way he had wanted them to and they were taking a long time to build up. Defeated, he went back to the Black Spirits to find that some of the members had left to join other groups. 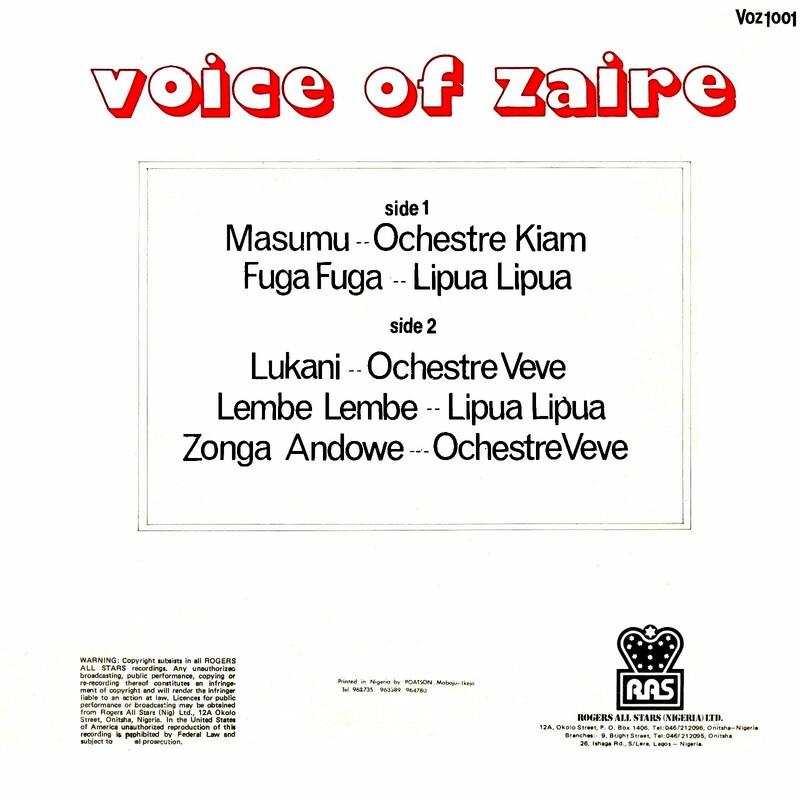 By January, 1985 the line up of the Black Spirits stood as follows: Max Chiwara (who succeeded Bartholomew Chirunda) on lead guitar, Robert Mtukudzi on rhythm guitar and keyboards, Joseph Alphonso on bass, Julius Manduma on vocals and percussion, Innocent Makoni, vocals, James Austin on drums, Nicholas Kunaka on vocals (doubling up on bass) and Felix John on rhythm. Oliver is a very subdued person who only speaks when spoken to yet when one sees him in action On stage, they are likely to get the impression that he is an extrovert. He is a very serious-minded person with a lot of self discipline. He is very modest about his capabilities, but there is no doubt that he has made his mark in the history books of Zimbabwe's most talented musicians. Download Sugar Pie as a zipped file here. Liberia has never played a big role in the African music scene. 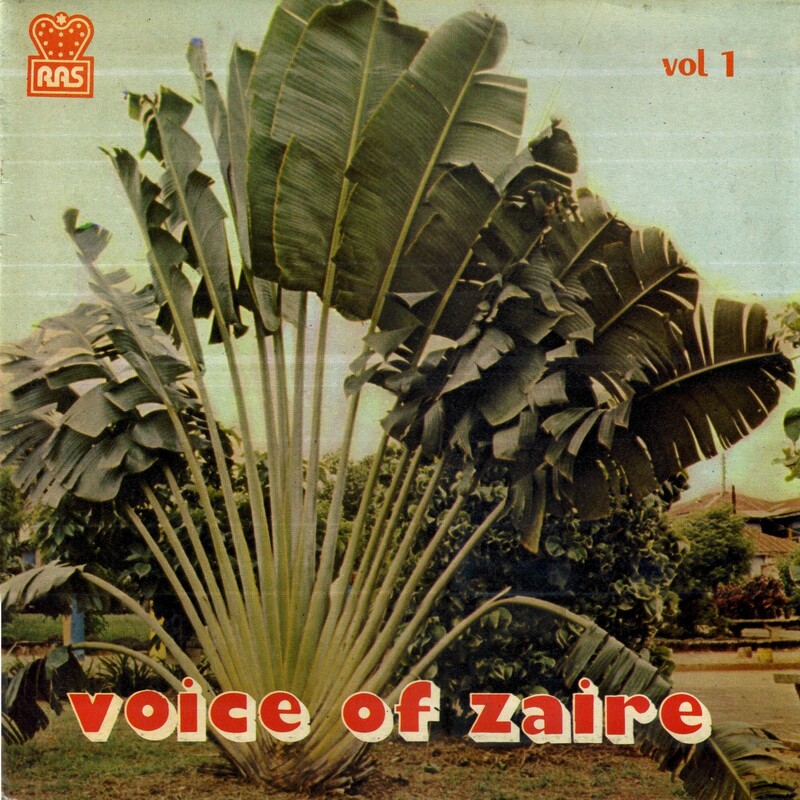 In a fascinating post on his old Voice of America blog, Matt Lavoie surveys the 1960s Liberian musical landscape and includes a number of recordings. The Ghanaian producer Faisal Helwani set up a recording studio in Monrovia in the early '80s, and claimed to have 54 albums ready for release, but apparently only two, by Fatu Gayflor and Cesar Gator, saw the light of day. Increasing political and economic instability, leading to the onset of the first Liberian Civil War in 1989, put the kibosh on whatever musical scene existed in the country. 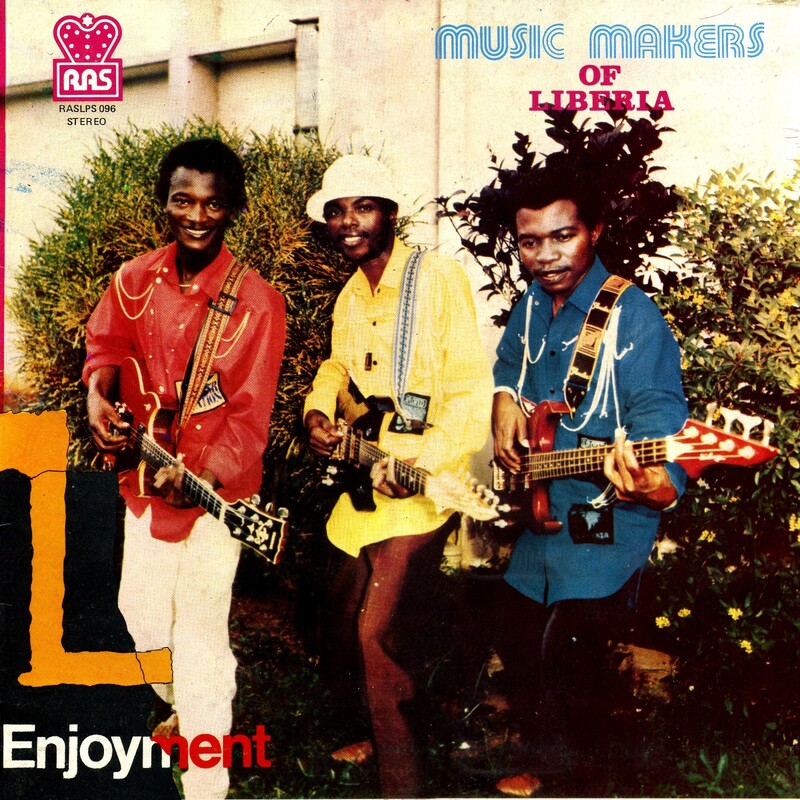 At some point a Liberian band, the Music Makers, made it to Onitsha, Nigeria, where they were recorded by R.E. 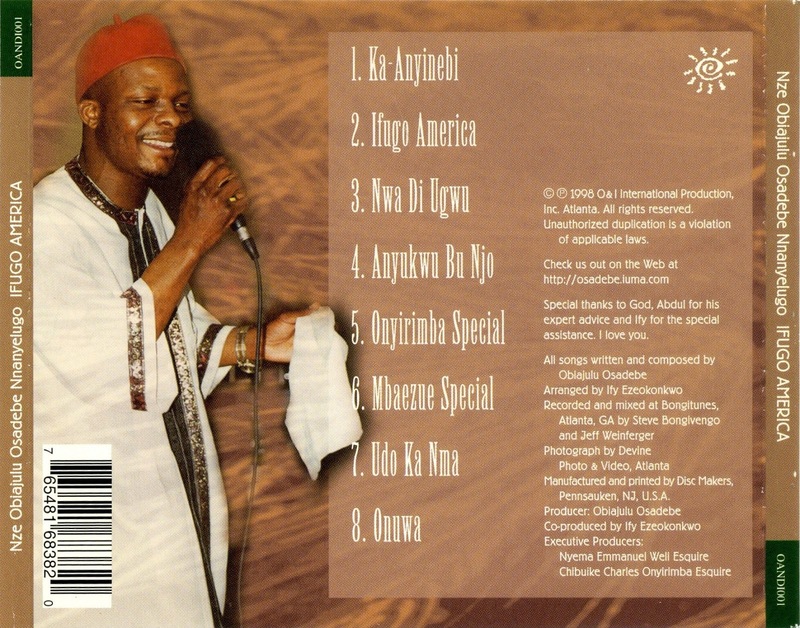 Okonkwo's legendary Rogers All Stars label in 1988. 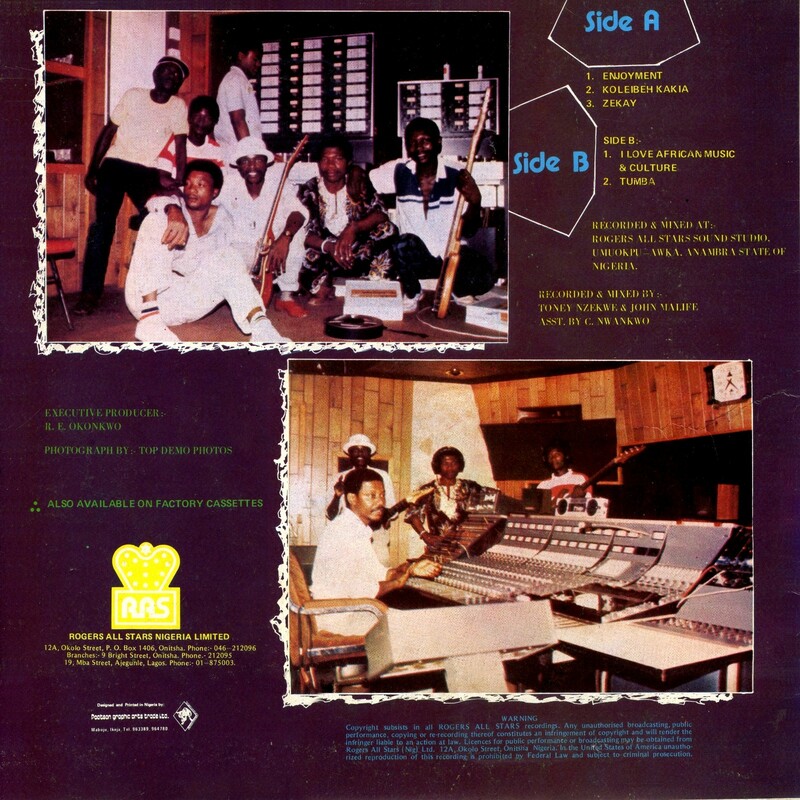 Their album Enjoyment (Rogers All Stars RASLPS 096) brings to mind the sound of Afro National from neighboring Sierra Leone, who acheived fame in the 1970s. Other than that I can't tell you anything about this enigmatic group. 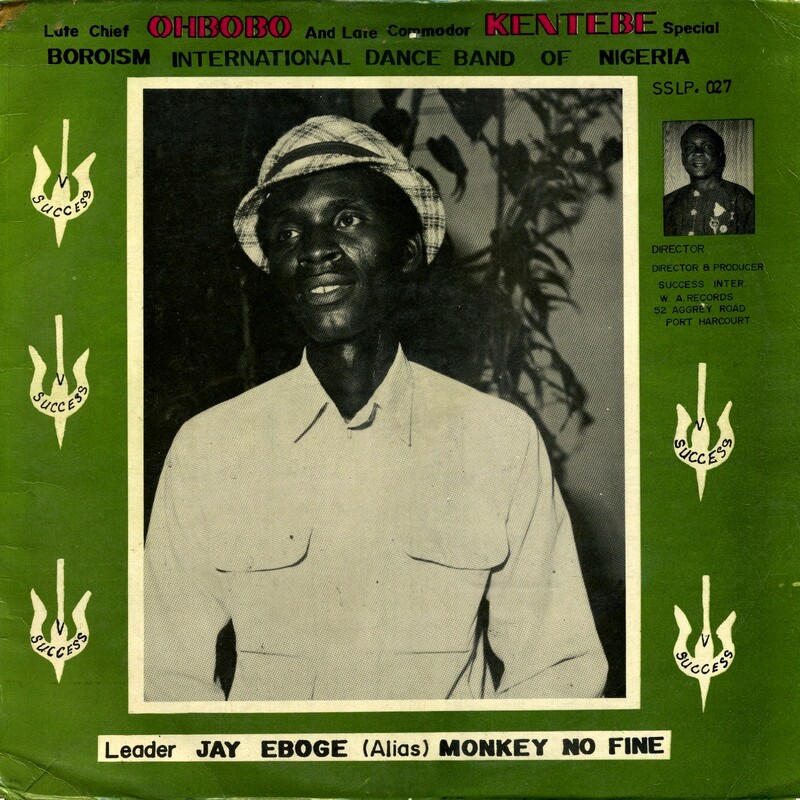 Enjoy this sample from the lost world of Liberian music! Download Enjoyment as a zipped file here. 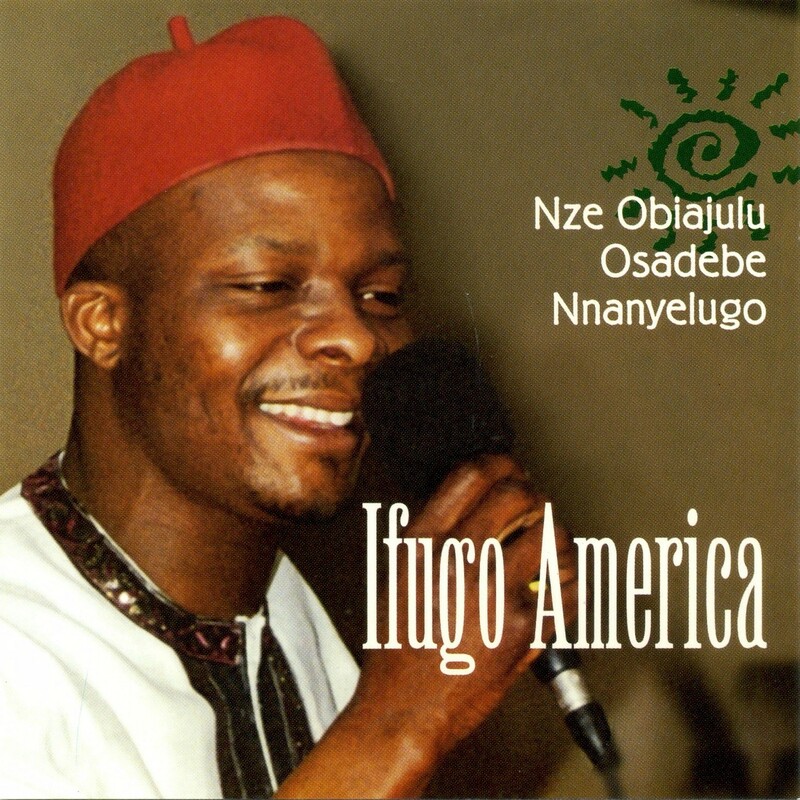 A technical note: This album is one of a number I picked up directly from the Rogers All Stars office in Onitsha. One thing I've noticed about these late-'80s RAS LPs is the muddy quality of the sound. I have no idea why this should be: poor mastering? I've tried to compensate for this by boosting the high and low frequencies slightly, to limited effect. My apologies. 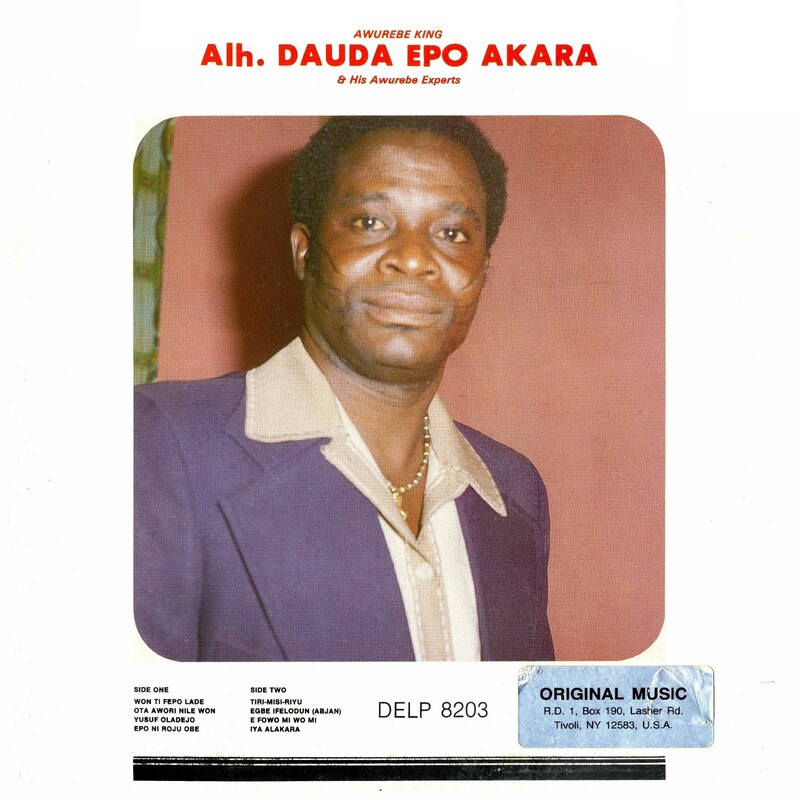 Some years ago I posted the LP Pre-Festival Lagos 77, featuring tracks from a number of Guinean orchestras who were in competition to appear at the memorable Second World Black and African Festival of Arts and Culture, or FESTAC '77, which was held in Lagos in 1977. This disc is an ethnology page. It retraces moments of initiation. The initiation marks in the traditional society the passage of the child-adolescence the maturity, at the age of responsibility. 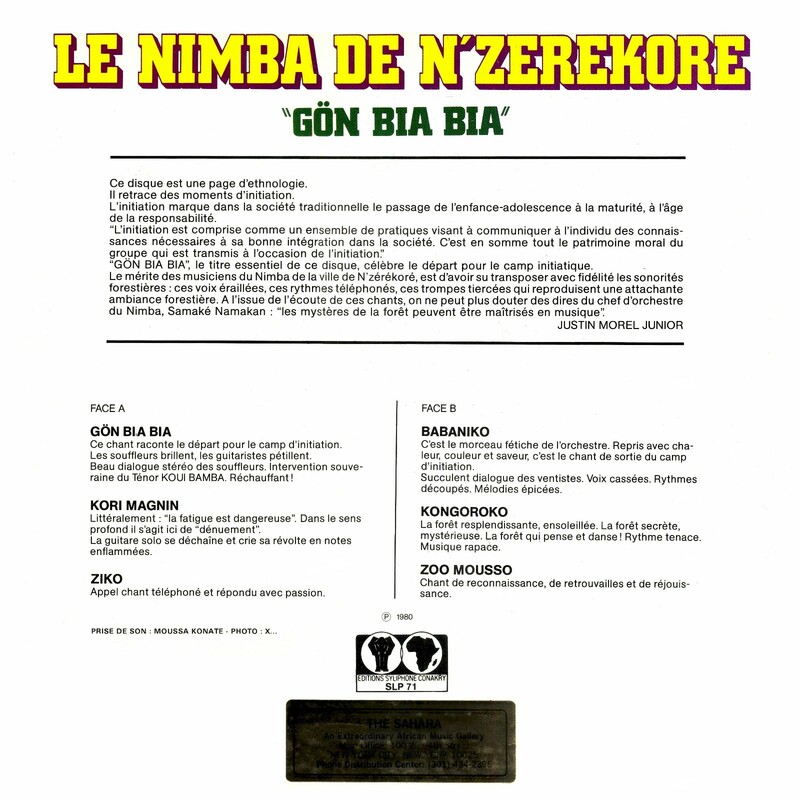 GÖN BIA BIA", the essential title of this disc, celebrates the departure for the initiatory camp. The merit of the Nimba musicians of the City of N'zérékoré, is to have been able to transpose the sounds with fidelity. Foresters: these hoarse voices, these phoned rhythms, these tiered horns that reproduce an endearing forest atmosphere. 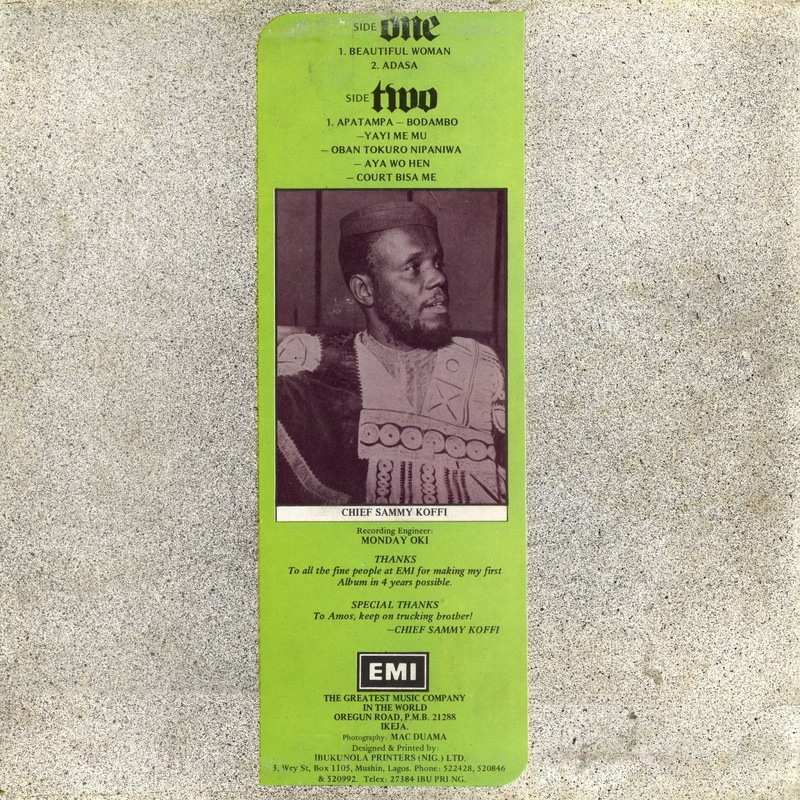 At the end of listening to these songs, we can no longer doubt the words of the conductor of Nimba, Samaké Namakan: "the mysteries of the forest can be mastered in music"
Comments on the songs likewise are from the liner notes, via Google Translate. 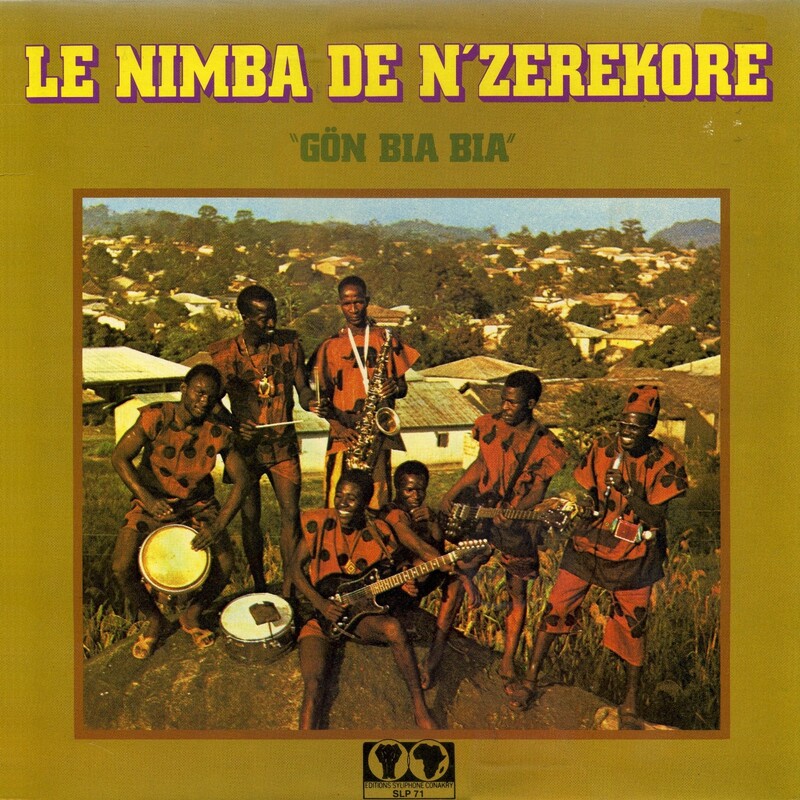 Gön Bia Bia - "This song tells of the departure for the initiation camp. Blowers shine, guitarists sparkle. Beautiful stereo dialogue blowers. Sovereign intervention of tenor KOUI BAMBA. Warming!" Kori Magnin - "Literally: 'Fatigue is Dangerous.' In the deep meaning it is about 'deprivation.' The solo guitar breaks loose and screams its revolt in enflamed notes." Ziko - "Call singing telephoned and answered with passion." Babaniko - "This is the favorite piece of the orchestra. Taken with warmth, color and flavor, it is the song of exit of the initiation camp. Succulent dialogue of the wind. Broken voices. Rhythms cut. Spicy melodies." Kongoroko - "The forest is resplendent and sunny. The secret forest, mysterious. The forest that thinks and dances! Stubborn rhythm. Rapacious music." Zoo Mousso - "Song of gratitude, reunion and rejoicing." Download Gön Bia Bia as a zipped file here. A technical note: this is one of the first albums I digitized a dozen years ago when I was first getting started with this blog. I hadn't yet mastered the software and there's a little clipping on some of the tracks. It's not too noticeable, though. My apologies. 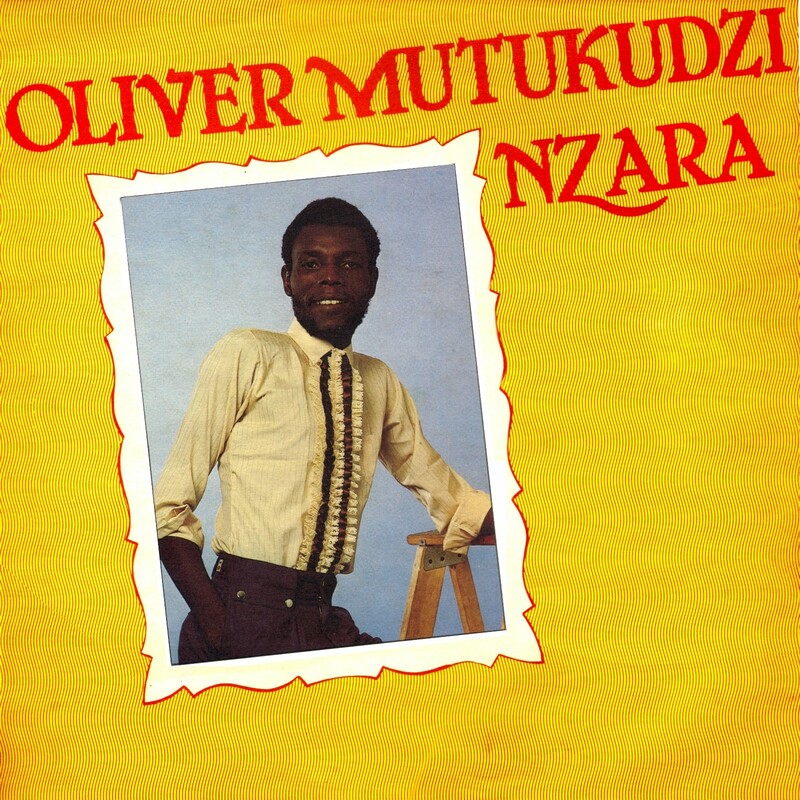 Oliver "Tuku" Mutukudzi has been called "The Otis Redding of Zimbbawe," a comparison that has always irritated me. 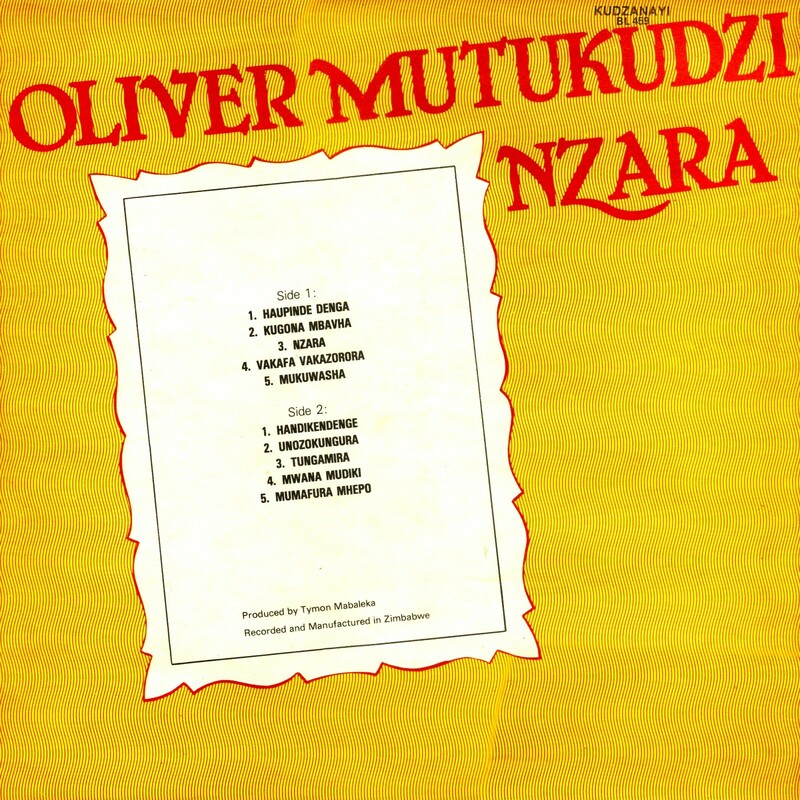 Oliver Mutukudzi isn't the Otis Redding of Zimbabwe, he's the Oliver Mutikudzi of Zimbabwe - his music stands on its own, it's unique and incomparable. Moreover, these sort of analogies, well-meaning, often made by publicists and music journalists, seem really ethnocentric, as if American or European music is the baseline against which all other music is defined. End of rant. Born in 1952, Oliver grew up in Highfield, the historic African "ghetto" of Harare (called Salisbury under Ian Smith's racist Rhodesian regime) and learned to play a homemade instrument from a book called "It's Easy to Play the Guitar." 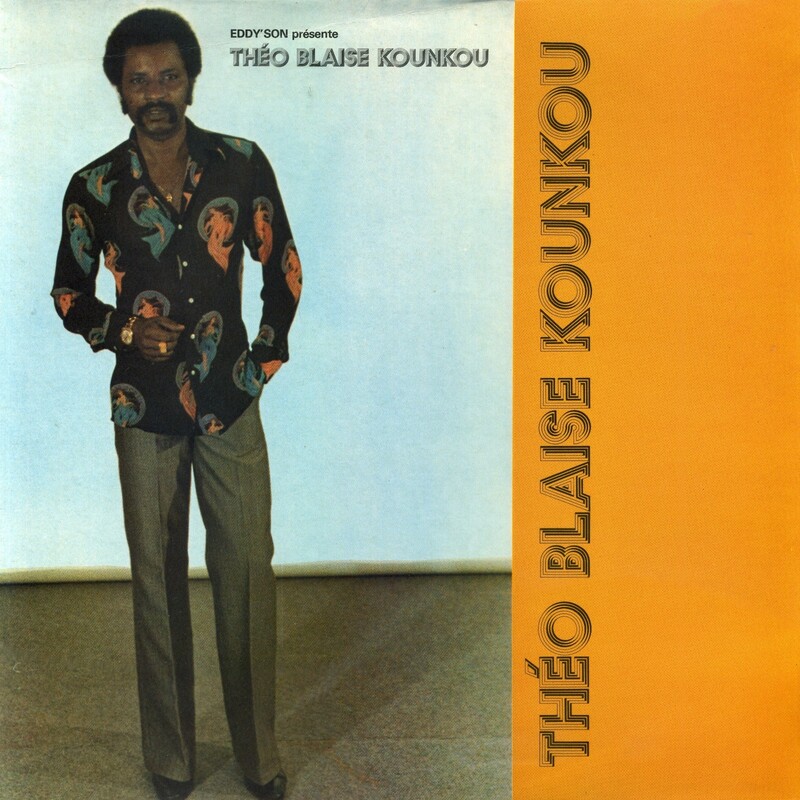 He started singing gospel music and in 1975 joined Thomas Mapfumo in the Wagon Wheels band. By the '80s, as a solo artist, he had acheived massive fame in Zimbabwe, with many best-selling singles and albums and growing popularity across Southern Africa. By the turn of the century, several international releases and tours had made Mutukudzi, along with Mapfumo, one of the two most popular Zimbabwean musicians in the world. 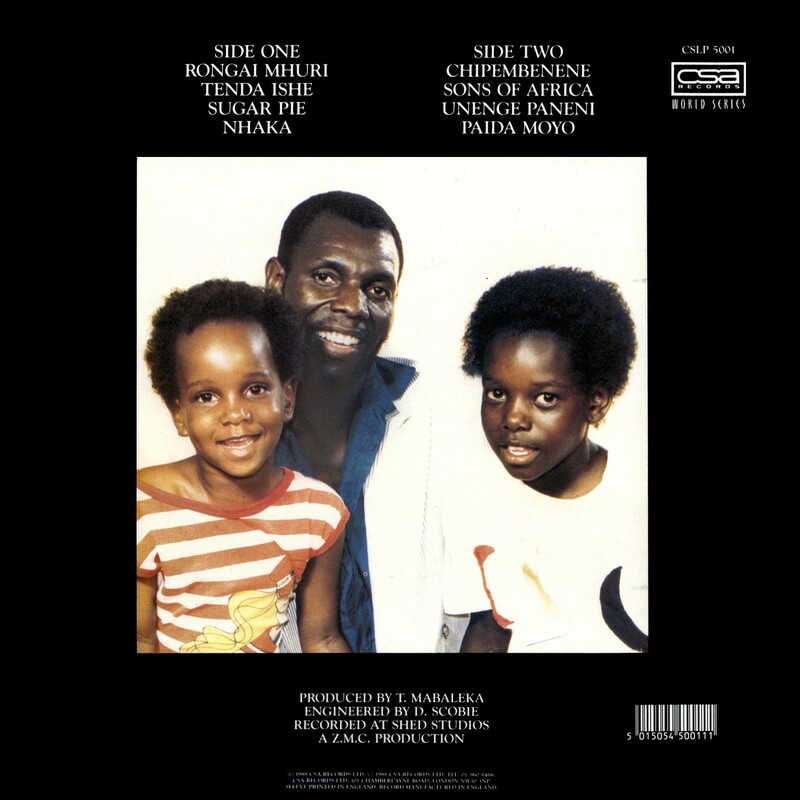 Here is Nzara (Kudzanayi BL 459), a 1983 release that showcases Tuku at the peak of his powers, his soulful voice soaring above inspired arrangements and a variety of styles. Enjoy! Download Nzara as a zipped file here. 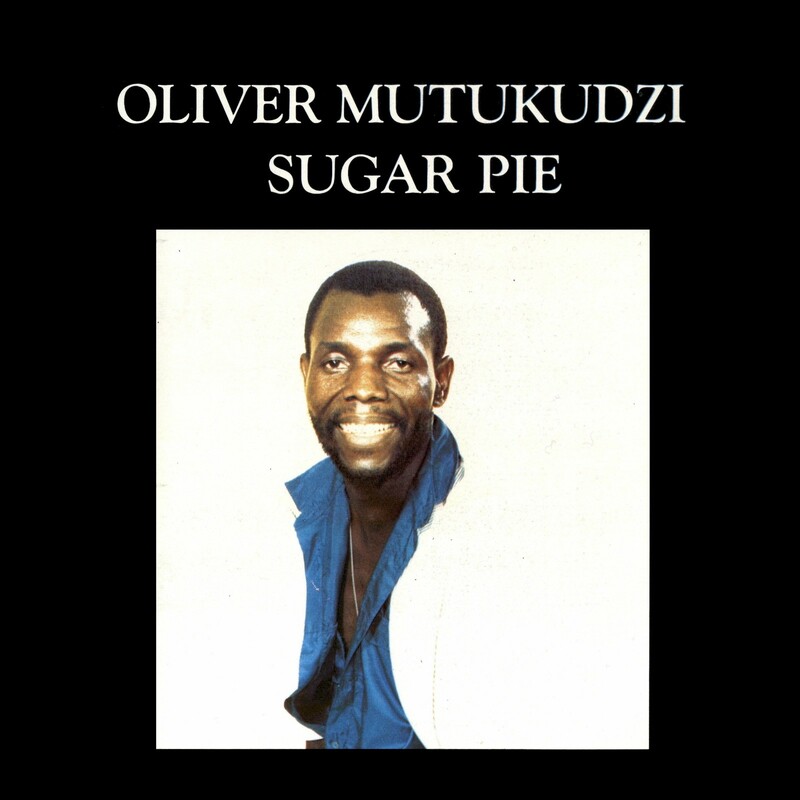 I have another album by Oliver Mutukudzi, Sugar Pie, that I'll be posting soon. 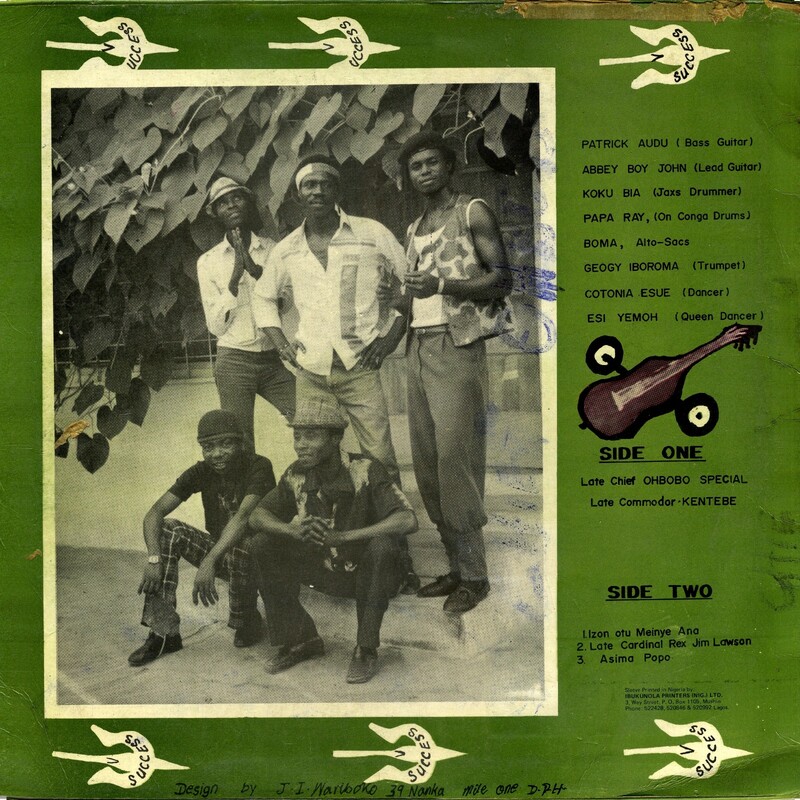 The Okukuseku International Band, led by Sammy Koffi, was a Ghanaian group that made its way to Nigeria in the '70s and built an enduring career there. In this Okukuseku was not alone: the '70s oil boom was like a giant magnet that drew musical talent from across Africa. 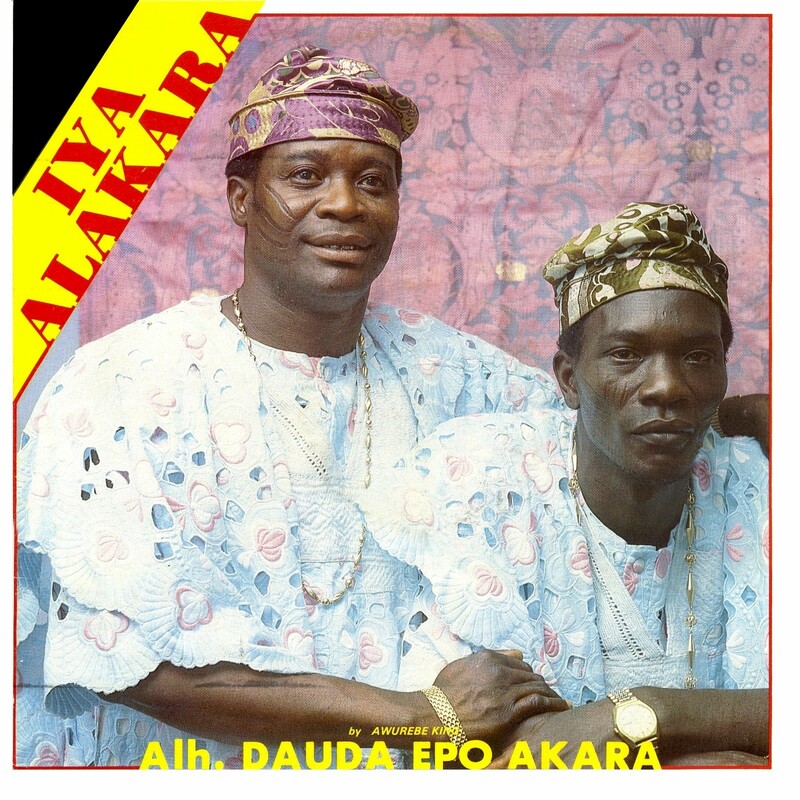 When the Nigerian economy crashed in the '80s these musicians were all sent packing. 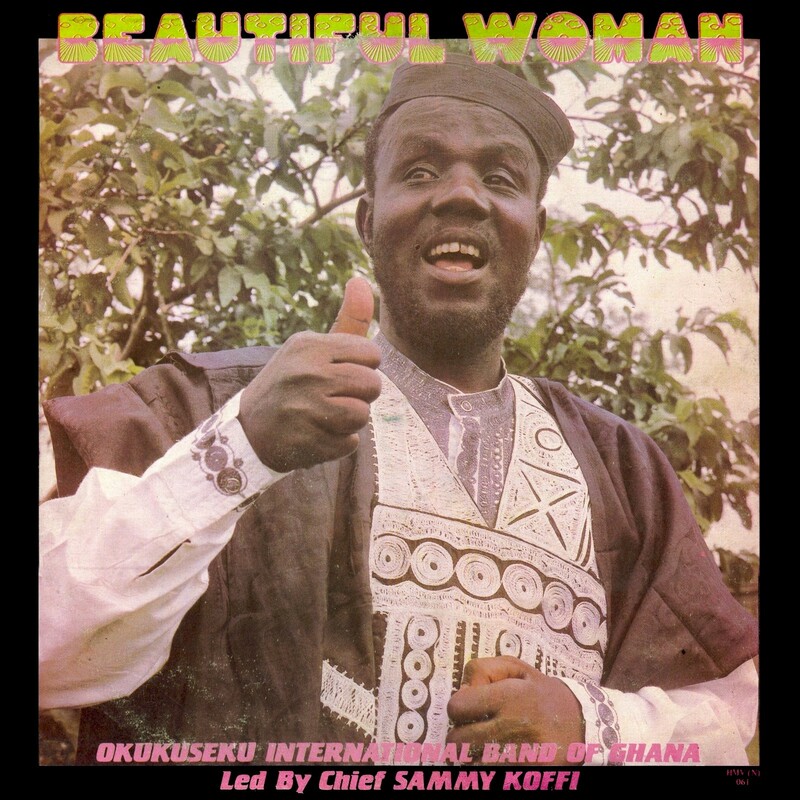 Sammy and Okukuseku apparently also retreated to Ghana, but by 1989 they were back in Nigeria, where today's offering, Beautiful Woman (His Master's Voice/EMI Nigeria HMV (N) 061), was recorded. Sammy Koffi himself started out with K. Gyasi's band in Ghana in the '60s, before leaving to form Okukuseku's No. 2 Guitar Band in 1969. I've been wanting to post something from Okukuseku for a while. Thing is, quite a bit of their material has been posted on various blogs already, notably Moos's Global Groove, which has an extensive selection. Beautiful Woman, to the best of my knowledge, has not been made available before. In fact, it's not even included in Discogs' extensive listing. So, double bonus! The title song, "Beautiful Woman," seems to draw on the same sentiment as, if it's not directly inspired by, Jimmy Soul's 1963 smash "If You Want to Be Happy," but I really enjoy the extended jam that takes up Side Two of this LP. I hope you'll enjoy it also! Download Beautiful Woman as a zipped file here. Side A of this pressing was off-center, resulting in a slight "wow." My apologies, couldn't do anything about it!